We've had to give up pretending this week and admit that Autumn is really here. 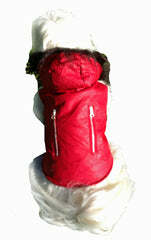 It's time to pull out the winter gear and figure out if the pups need new sizes before it gets really nippy. The fur babes are in luck, with both fab new items in the winter collections, and the return of some classics that no discerning pooch would be without for the colder months. Bed Hog, Stud Muffin, black and zebra vests, new PJ’s, new Angel, Swans and Eagles will all be arriving soon, together with new colour phat bum hoodie and tee. 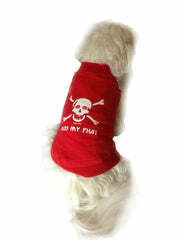 Also soon to arrive – phat weiner just for those elongated little bodies. Bedding is on sale this month with 20% off – but be quick as there are not many left. NB Beds are delivered by courier. 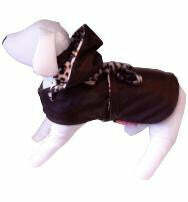 The Mackie Jacket is faux leather and sateen lined, which fends off the rain while keeping the fur babes warm. Notice the deeper shoulder edges to ensure ease of movement, double zip bling pockets so you never get stuck with out a baggie, and a faux fur trim to set off that most adorable of faces. Available in Red, Brown and Camel. For more casual outings for the girls there is the Audry leopard print wrap with detachable leopard hoodie. This is a lighter weight for days with a bit of a nip in the air, or when the fire isn't quite cutting it inside on a really cold day. Or even if the girl just wants to be a girl. Matching lead available for the Audrey. If you want to show a little more phatitude we've now got Kiss My Phat tees back in all sizes – find your fit here. Security tees in Large are also back in stock. Need a gift? 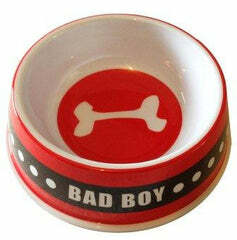 The Bad Boy bowl is a must have for any pup with a point to prove. 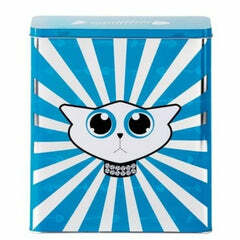 And for the cat lover you can’t miss out on the French designed quirky food storage tin. My terrible two some are enjoying rolling in the crunchy leaves but not so much their baths now that the weather is a bit cooler. Remember that polar fleece soaks up water like a sponge, so after that bath, just pop on their hoodie… you will be surprised at the result!! Just a plug for the The Lost Dogs’ Home that alone cares for more than 31,000 unwanted and abandoned cats and dogs in Australia each year. Coinciding with World Stray Animals Day, The Lost Dogs Home has extended is half price cat adoptions throughout the April school holidays. Full details at www.dogshome.com. Well, off to polish off the rest of the Easter eggs - remember that chocolate is bad for dogs (that is a good excuse not to give in to begging if ever I heard one).